The Olympus TG-860 is an incredibly tough compact digicam that is ready to stand up to whatever situation you find yourself in. iAuto allows anyone to shoot with it, and the built-in WiFi allows you to share from just about anywhere. Read more in our Full Conclusion. In February of 2015, Olympus added a new Stylus Tough series camera model. The TG-860 is waterproof to 50 feet (15 m), freezeproof to 14°F (-10°C), shockproof from 7 feet (2.1 m), crushproof to 220 pounds. It also features a 16MP backlit CMOS image sensor and a TruePic VII image processor for high resolution still images even in lower lightning conditions. With a 5x optical zoom lens (a 21-105mm 35mm-equivalent), you'll have plenty of zoom range. The 3.0" LCD display offers 180-degree tilting capability allowing for selfies in all sorts of extreme conditions. Built-in Wi-Fi works with a pair of Olympus smartphone/tablet apps to connect your iOS or Android device, and then transfer images and movies automatically, remotely control the camera itself from your device, or even use to device as an external monitor. The TG-860 also boasts HD video as well as interval, or time-lapse, recording modes. Full 1080 HD video records at 60fps, but you can also capture 720p @ 60p, or 120-240fps Super Slow Motion. Time-Lapse Movie Mode offers 0.5, 1, 3, 6, 12, 30-second intervals, while Sport-Burst Mode allows for 0.05-60-second shutter intervals between still images. I've had about an hour's time with the TG-860, so there will be more to come (not to mention a full in-depth review by one of our amazing staff writers). Upon first glance, the TG-860 is a slick little camera. It's tougher than ever before, despite having a flip-up screen for selfies (easy to take with an extra shutter button) and new features like built-in Wi-Fi. The first thing we did with the TG-860 is jump into a murky salt water pool to swim with a few dolphins and their trainers. The menu system isn't the easiest graphic user interface I've ever seen, but I'm pretty new to the Olympus world so that might be different for each user. That said, once you realize the Scene dial is the heart of this camera, that settings like HD video quality and frame rate or continuous shooting are accessible in specific Scene Modes, you instantly get it. So, learn a few pictures and what they're for, and you can figure it all out. Shooting stills above water was absolutely gorgeous, particularly in angles looking away from the sun, where blue skies could reflect clearly off the sun. Burst shooting was helpful in action shots, and the camera was quick enough to freeze splashing water from a dolphin's tail. Under the water still photography is a little more challenging. As I said, our water was murky, so that's not really the camera's fault, but there's a learning curve here when you can't seen the LCD. Basically, you need to get a sense of where the TG-860 is looking. I had a bad habit of instinctually tilting it too high. Taking movies under water, particularly of fast moving objects, was much easier, visually speaking, but -- and this could be a pre-production model issue -- I also managed to record all of them without sound. So perhaps the default setting in movie mode is to not record sound? I'm not sure yet. We'll try to clarify this. Overall, from a hands on / first look perspective, the TG-860 is a great little point and shoot, and it's never been cheaper to be this tough. Looking forward to more tests and the impending Full Review, which should be done in the next few weeks. 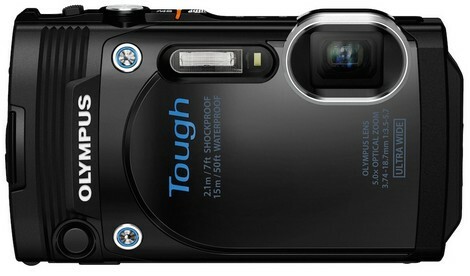 The Olympus Stylus Tough TG-860 will be available in April (2015) in Black, Orange and White for $279.99. Check our best price box at the top right of this page to see current online pricing. We'll be covering this in more detail on our Blog, but here are a few TG-860 Sample Images taken on an Olympus-sponsored trip to Bermuda where we took this digicam into a saltwater aquarium to swim with dolphins. The above-water pictures are gorgeous and, given how murky the water was, the underwater stuff is nice too. Just make sure, if you take your Tough Series camera into salt water, to rinse it off and soak it in fresh water afterwards.